Yuriko Kajiya and Artists of Houston Ballet in Ben Stevenson’s The Sleeping Beauty. Melody Mennite and Artists of Houston Ballet in Ben Stevenson’s The Sleeping Beauty. The Sleeping Beauty is one of the classical ballet’s most technically difficult yet visually dynamic works — a ballet by which ballet companies are judged. 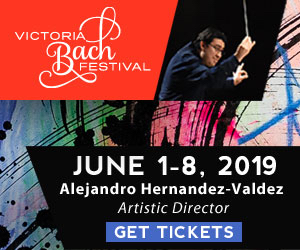 Houston Ballet’s version, with choreography by Artistic Director Emeritus Ben Stevenson (who directed Houston Ballet from 1976 to 2003) after Marius Petipa, is a shining example of the visual feast that comes from a top-notch company taking on Beauty. Stevenson’s version, though it keeps with tradition by employing a purely classical movement vocabulary, reimagines a few elements from the original Sleeping Beauty of 19th century czarist Russia, among them the wicked fairy Carabosse. In Stevenson’s ballet, she isn’t played by a man dressed as a woman, but rather by a woman donning black pointe shoes — yes, she’s still evil, but deliciously so. Because Stevenson’s Carabosse is more than just a character role, she gets more stage time than in the typical Beauty production. 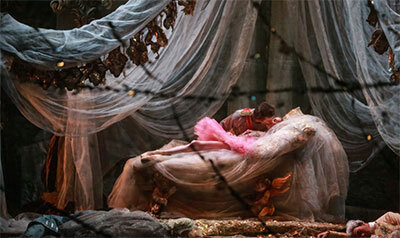 Sara Webb and Jared Matthews in Ben Stevenson’s The Sleeping Beauty. Feb. 27’s evening performance at Wortham Theater Center had Jessica Collado in the role of Carabosse, the character from which the ballet’s drama originates. At the christening of Princess Aurora, Carabosse, tired of being shunned by the king and queen, casts a spell over the innocent child: She will grow up to be beautiful, but will one day prick her finger and die. It’s not until the Lilac Fairy intervenes (the long-limbed, wonderfully elegant Katharine Precourt) that the spell is modified; Aurora will instead fall into a deep sleep that can only be broken by a prince’s kiss. Before the first spell is even cast, the Lilac Fairy and her five friends bestow the gifts of beauty, generosity, charm, song and temperament upon the infant, commemorating each gift with a short dance. Desmond Heeley’s opulent costume designs are on full display here: Each fairy wears a decadent, bejeweled tutu, each seemingly more impressive than the last. The quick-footed Jacquelyn Long as Fairy Song was stunning; wearing a canary-yellow tutu, her sharp, fluttery motions matched the chirpiness of that moment in Tchaikovsky’s landmark score. Another stand out was Chae Eun Yang as Fairy Charm, who hopped delicately en pointe through that variation’s choreography. 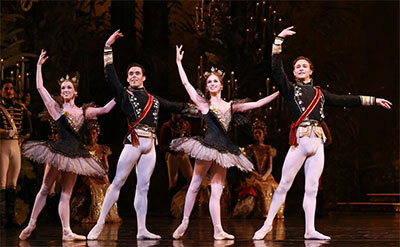 Artists of Houston Ballet in Ben Stevenson’s The Sleeping Beauty. As Feb. 27’s Aurora, Yuriko Kajiya possessed that ideal blend of innocence and bashful curiosity. Courted by four suitors at her 16th birthday, the pink-tutu-clad Aurora dances the ballet’s most iconic section, known as the Rose Adagio for the roses she collects from each suitor as they partner her through a series of one-legged balances en pointe. I had never before seen a Beauty that had each suitor’s country of origin indicated by his costuming; it was a nice touch. Kajiya glided through the Rose Adagio as though she danced on air, holding the final balance an impressively long time (thunderous applause erupted from the audience). The first act ends with Aurora pricking her finger and falling into a deep sleep. In the second act, Prince Florimund (danced by Connor Walsh on Feb. 27) enters the scene. The act opens with one of the most beautiful ensemble dances in the ballet canon — a choreography done with flower garlands where the dancers crisscross the stage. The Lilac Fairy introduces a vision of Aurora in white to the prince; here, she’s more refined. It’s love at first sight. Karina Gonzalez and Charles-Louis Yoshiyama in Ben Stevenson’s The Sleeping Beauty. In the final act, the court celebrates the wedding of Princess Aurora and Prince Florimund. Many of the attendees are storybook characters, including Puss-in-Boots and his partner-in-crime, the White Cat; Princess Florine and her partner, the Bluebird; and the Ivans. Natalie Varnum and Harper Watters made a hilarious pair of cats, alternately showing affection and cat-clawing each other (as cats are wont to do). Christopher Gray’s compact frame made for an ideal Bluebird as he soared through the repeated jumps required of the role. The Friday Feb. 26 cast included a sprightly Princess Aurora in Karina Gonzalez, all girlish with rock solid balance in the Rose Adagio and pure elegance in the final act. Nao Kusuzaki’s lovely Lilac Fairy exuded a serene beauty, while Soo Youn Cho’s Carabosse added a touch of danger. And how great to see the recently promoted Derek Dunn back on stage in top form in Bluebird with the sparkling Allison Miller at his side as Princess Florine. 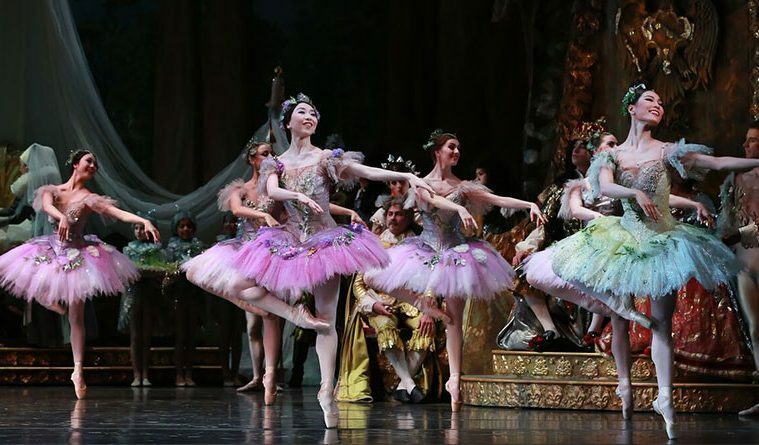 There is one word that encapsulates Houston Ballet’s Sleeping Beauty: Decadent, with a capital D. The sets, the costumes and, above all, the dancing, live up to any expectations balletomanes may have when it comes to this canonical ballet. Claire Christine Spera grew up dancing ballet, modern, and Spanish flamenco. 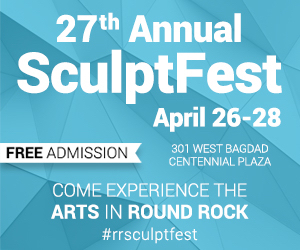 A graduate of the arts journalism program at the University of Southern California Annenberg School for Communication & Journalism, she has been a freelance dance and theater critic for the Austin American-Statesman and other publications since moving to the capital city in fall 2010.